Travelers adore Spanish Paradores for a multitude of reasons. 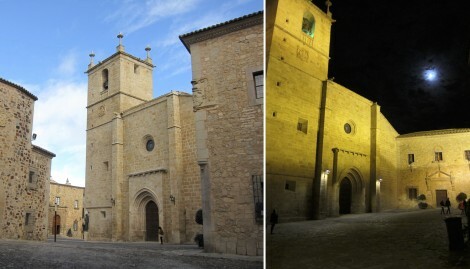 The Spanish-government owned and operated inns are sprinkled throughout Spain in spots most useful to tourists. Some are near major tourist attractions in large cities. Others grace small villages. And a few sit in far-flung, remote areas with little other choice of accommodations. 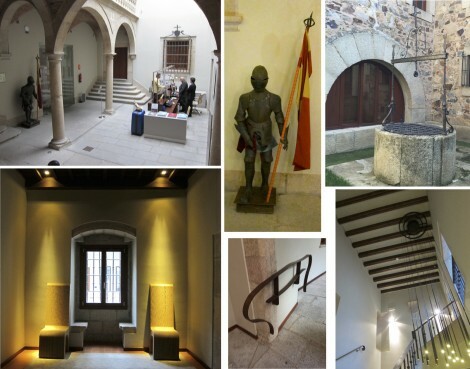 The most interesting Paradores occupy historic buildings. Some fill ancient castles, and centuries-old mansions and monasteries. Others are built into such unusual places as former forts and 15th century hospitals. And last, but never least, is style and substance. Each Parador is unique. Some are WOWs. A few, bare bones. Yet Paradores share similar traits. All offer restaurants serving authentic regional specialities; rates that are downright bargains when compared to similar hotels—as if there were similar hotels; and experiences rich with style and substance. 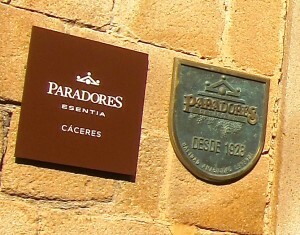 Parador de Cáceres is one of the greats and sports all of the attributes that make Paradores so popular. 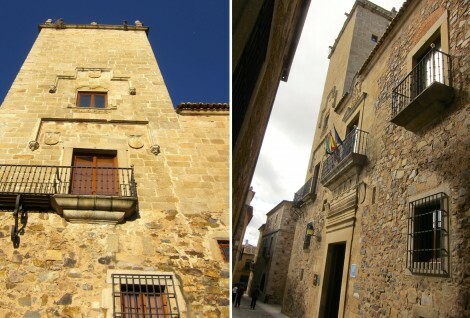 Parador de Cáceres spreads through two large and rambling 14th century palaces. The oldest part of the property is a tower, which stands tall despite Queen Isabel’s orders of 1477 that all towers of Cáceres be cut down. Within the Gothic buildings, guests find a wonderful array of architectural gems: stone arches and pillar, vaulted ceilings, iron railings curving up slender stone staircases, a magnificent mantelpiece and a courtyard with an original cistern used to collect rainwater. Decorative leftovers from former occupants, such as a 2nd century Roman tombstone, a Baroque coat of arms and a knightly suit of armor, fill nooks and crannies. As to style and substance, this Parador’s cup overflows. Created in 1989, and refurbished between 2009 and 2011, the Parador now sets the standard for energy efficiency without sacrificing any of its historical attributes. The 39 guest rooms, reached by two small elevators and a marvelous maze of walkways, differ in size and configuration, but wear similar, simple-but-comfortable decor. All rooms have T.Vs, Wi-Fi, mini bars and sleek bathrooms with bidets and huge bathtubs. 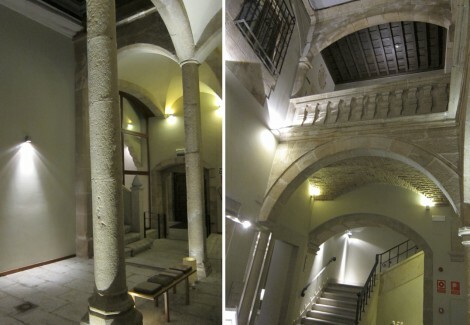 My room’s window opened to overlook a narrow cobblestone passage and another ancient building. In addition to country-fresh air, the window ushered in a sound track of medieval times in the form of footsteps clopping on the cobblestone walk and bells from many churches ringing in the hour. 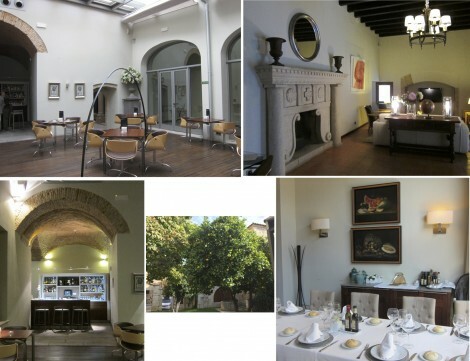 In addition to great location, stunning architectural features and comfortable rooms Parador de Cáceres offers guests pleasant places to gather, including a cosy second floor sitting room, a contemporary cafe/bar and a terrific restaurant. Perhaps now is the time to mention that Cáceres was claimed Spain’s culinary capital for 2015 and the Parador’s restaurant does the title proud. 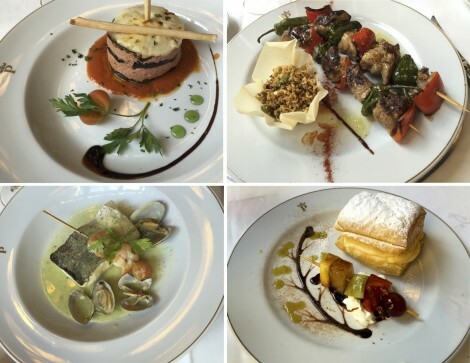 Lunch and dinner menus feature specialties of the Extremadura region, intermingled with a fusion of dishes influenced by Portuguese neighbors as well as Roman, Arab, and Jewish cultures that one time flourished in the city. All dishes are beautifully prepared and artistically presented. But it’s the buffet breakfasts that best captures the spirit of the region by serving not only a stunning array of Extremadura’s best cheeses and meats, but also local favorites including pastries made by nuns in cloistered convents, and traditional Spanish dishes, such as the beloved Tortilla Española. Although known in English as Spanish omelet, Tortilla Española is more of a flavorful potato cake held together with eggs than a traditional omelet. The Parador’s serves a classic version made with potatoes and onions as well as a variant made with added ingredients, such as zucchini. 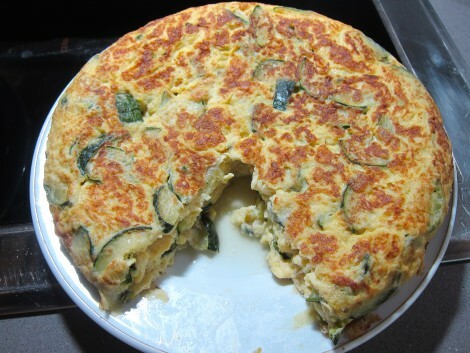 (The zucchini version, shown below, is called Tortilla de Calabacín.) Each version is surprisingly much better that one would imagine from the sum of its parts, which you can see for yourself by following this Parador provided recipe. Put oil in a 10-inch heavy or nonstick skillet. Set skillet over high heat. When oil is very hot, but not smoking, add potato mixture. Reduce heat to so that oil simmers and cook, occasionally lifting and turning ingredients, until the potatoes are tender, but not brown and not falling apart, about 15 minutes. With a slotted spoon, transfer sautéed potatoes, onions and zucchini to a colander and set aside. Drain oil from skillet, reserving 4 tablespoons. Scrap any potato particles from pan with a spatula. Wipe pan with a paper towel to remove any residue. In a large bowl, beat eggs until well blended. Add potato mixture to the eggs and gently mix to evenly distribute ingredients. Put 2 tablespoons of the reserved oil in the pan and set pan over high heat. When the oil is very hot, but not smoking, gently add the egg/potato mixture, spreading ingredients evenly in the pan. Reduce heat to medium and cook until the bottom of the tortilla is lightly browned, 3 to 5 minutes. Gently shake pan so tortilla doesn’t stick, then slide a spatula along edges and underneath tortilla. Place a large plate over pan and quickly turn plate and pan over so tortilla falls onto plate. Add the remaining 2 tablespoons reserved oil to pan and heat until oil is hot. Slide tortilla, uncooked side down, into the skillet, carefully tucking in sides with the spatula. Continue cooking over medium heat until eggs are completely set, about 3 minutes. Give the pan a shake to loosen the tortilla (or help it along with the spatula) and slide tortilla from pan onto a serving plate. Cool slightly or to room temperature before cutting into wedges to serve. 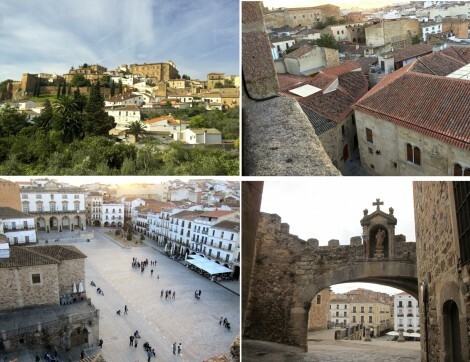 For more information about Cáceres (beautiful by day and night), click HERE.